Here’s another perfect illustration of the frustration generated by Apple’s decision to limit the user’s options when it comes to downloading software updates in Snow Leopard, already discussed in yesterday’s post. Now, I am not a Final Cut user, but I am a Logic Studio user. 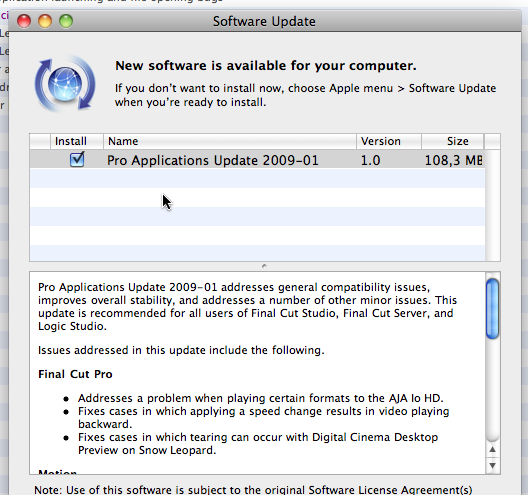 Logic Studio is one of Apple’s “pro” applications, and so I apparently need the update. But of course, since it’s a sizable download (108.3 MB), I would like to download it just once and be able to keep a copy of it on a local hard drive, so that I won’t have to download it again if I ever need to reinstall Logic Studio or to install the update on someone else’s machine. As indicated in yesterday’s post, the only option remaining in Snow Leopard’s user interface is now to go to Apple’s Downloads page on the web and download it as a stand-alone updater from there. Yes, I am a French Canadian, but I use English as my user interface language. Obviously, that does not count. But that’s not the worst. The worst is that this URL takes me to a page with zero results! Good grief. If you are going to try and make a link to a web page pass off as a decent alternative for a built-in feature such as the “Install and Keep Package” command available in Leopard, at least you could have the decency to make sure that this link takes the user to an appropriate web page! Alas, it’s obviously too much to ask. But look at the file size! It’s now over 243 MB, instead of the 108 MB indicated by Software Update. So I am trying to save bandwidth by going on the web to download the stand-alone updater and be able to keep it, and for this I am punished by Apple, who forces me to download a stand-alone updater that is more than twice as big as the one I apparently need. Like I said yesterday, this is clearly due to the fact that, when you have to download things via the web, there is no way for the web site to determine what your machine actually needs, so instead you get the default update, which is the full one that also includes all the stuff you don’t need. The bottom line here is that, by forcing users who want the stand-alone updaters to go through the web, Apple effectively forces them to download bigger updates, even though those who want stand-alone updaters are precisely those with tight bandwidth constraints. Makes perfect sense, does it not? I guess I am going to have to give Rob Griffiths’s suggestion a try and run softwareupdate -d in Terminal instead. That means no visual feedback, no progress bar, even though visual feedback is actually useful and more than just eye candy when you have limited bandwidth, but such is our lot in Apple’s severely distorted reality, I am afraid. This entry was posted by Pierre Igot on Friday, October 23rd, 2009 at 6:52 pm	and is filed under Macintosh. You can follow any responses to this entry through the RSS 2.0 feed. Responses are currently closed, but you can trackback from your own site.